Social media sites like Facebook are often charged with increasing political polarization by establishing what are called “echo chambers,” places of discourse that prevent people from being exposed to things that contradict their beliefs. It is commonly believed that exposure to opposing opinions is a good thing, as it allows one to empathize with their interlocutors and see the merits of another point of view. 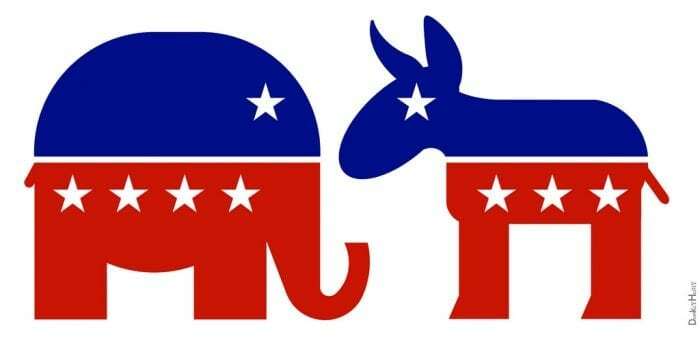 A recent study published in the Proceedings for the National Academy of Sciences seems to imply the opposite though, increased exposure to opposing political views can actually increase one’s political polarization. After recording the respondents’ answers, the study offered them a financial incentive to follow a Twitter bot that retweeted content from elected officials and public figures who share opposing political views. Crucially, respondents were not told what kind of content the Twitter bot would send out. At the end of the month, the researchers resurveyed the respondents about their political opinions and checked the datasets for any changes. The results indicated that liberals who had followed a conservative bot showed a slight increase in liberal attitudes, but not to any statistically significant degree. On the contrary, Republicans who followed a liberal Twitter bot showed a substantial increase in conservative political opinions. Of the Republican respondents who fully completed the ending survey, the researchers measured an average increase in polarization of .60 points, around .59 standard deviations. Even when controlled for both age, and for initial extremeness of position, the results stayed the same; Republicans had a much more pronounced polarizing reaction to exposure to opposing political opinions. Thus, it seems that this “backfire effect” is more likely to be seen and be more pronounced in Republicans than Democrats. Incidentally, these findings are consonant with one of the researchers initial hypotheses; that any measured backfire effect would be stronger for Republicans than for Democrats. Although the researchers are still unsure of the mechanism that creates the backfire effect for Republicans, they have a few ideas. A sizeable amount of psychological research has found that those who identify as political conservatives value certainty and tradition more than those who identify as political liberals. It is thought that these values create a sort of ideological buffer where, when confronted with uncertainty, conservatives increase their certainty. Additionally, there is evidence that conservatives are more likely to have negative opinions of “outgroups”. Thus, it seems likely that when confronted with opinions from what are perceived as outgroups, conservatives would be likely to react negatively to those opinions. In general, it seems that conservatives and liberals attach differen weights to certain moral values, which could go towards explaining why conservatives have a larger polarizing reaction. The researchers also consider whether race or gender could have had an effect of polarization as well. 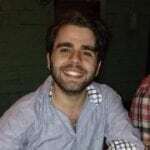 Because there are more liberal opinion leaders who are women or ethnic minorities, and because men constituted a large share of Republican respondents than Democratic respondents, the increase in polarization could reflect conservative male beliefs that women or ethnic minorities should not hold positions of power or influence. 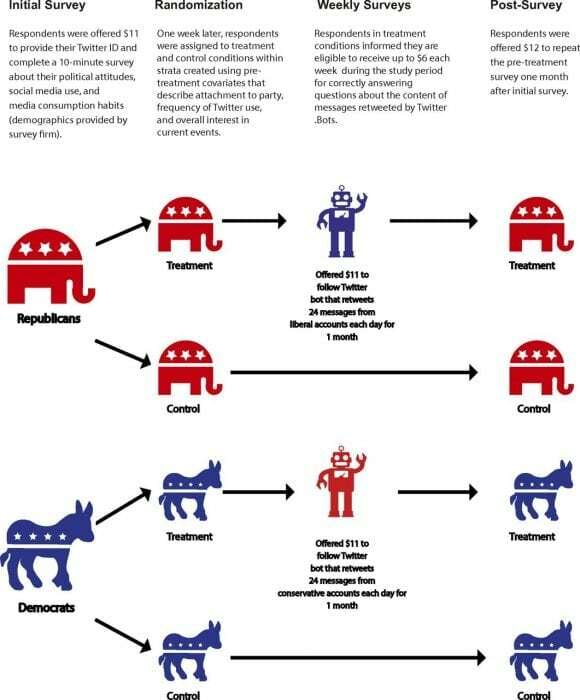 It is also possible that, given that many of the Tweets from the liberal bot came from high-profile “elites”, the increase in polarization could reflect an anti-elite sentiment among Republicans. The researchers are clear to point out limitations on their study and the conclusions that can be drawn from it. Mainly, they caution that we should not conclude that exposure to opposing political beliefs increases polarization in all settings. In fact, some evidence suggests that inter-group contact can decrease prejudicial attitudes and contribute to compromise, so the findings might be limited to online social media sites where people do not have face-to-face contact with those who hold different opinions. Additionally, the majority of Americans do not use Twitter, and so these findings might only generalize to the party-identified Americans that shows heavy social media use. Prima facie, these findings are of interest for those who are seeking to decrease political polarization in the online sphere. In particular, it seems to indicate that deliberate attempts at online exposure are at best ineffective and at worst counterproductive-particularly when spearheaded by liberals. At a time when political polarization is higher than it has ever been, new strategies are needed to foster compromise and understanding.